Kathleen B. Kunz Protestors display the names of people killed at the U.S.-Mexico border. National Border Patrol Council Vice President Art Del Cueto spoke to a group of about 20 college students and invited guests at last week's University of Arizona College Republicans Club meeting at the UA Student Union Memorial Center. 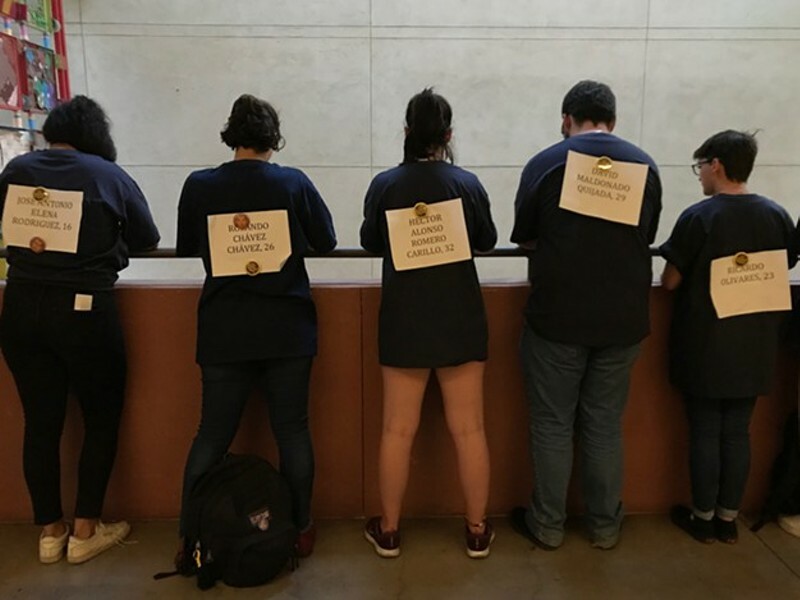 Outside the Santa Cruz Room, dozens of student and community activists protested Del Cueto's visit in silence, clad in Navy blue T-shirts with the Border Patrol's logo, except the shirts read "Murder Patrol" instead. UA staff members were also outside the room monitoring the meeting and silent protest. The event followed a tense three weeks on campus, after a March 19 incident that resulted in three students being charged with misdemeanor crimes. Student activists protested and confronted the BP agents' unexpected presence. A video that captured the exchange was posted online and went viral. As a result, the students involved in the protest received an overwhelming amount of personal threats online. Del Cueto called on the university to investigate whether the students violated the university's code of conduct or Arizona law regarding disorderly conduct. UA President Robert Robbins indicated in a school-wide email on Friday, March 29 that the UA Police Department determined they will charge two students with interference with the peaceful conduct of an educational institution. A third student was later charged after being recognized by a UA police officer at an unrelated traffic accident. In the email, Robbins wrote that the university is committed to free speech, but the student club and the BP officers should have been able to hold their event without disruption. "Student protest is protected by our support for free speech, but disruption is not," he wrote. College Republicans Club President Cassandra Bauserman said that their invitation to Del Cueto was not meant to further provoke student activists on campus, but to give club members a chance to interact with a Border Patrol representative. "I'm here to spread true light and knowledge because I think there's a lot of misconceptions about what a lot of us do," Del Cueto told the students. "I think there's a lot of misconceptions within the media where you guys are at a very young age and you cannot allow yourselves to fall victim to those traps." Days after the March 19 incident, DACA recipients of the university penned a public letter in support of the student protestors who were charged. They wrote: "Pervasive detentions and family separations have been a reality outside of the boundaries of the University of Arizona. Just these last two weeks, we are aware of at least 10 Border Patrol interactions with immigrants in Tucson. One of them occurred on Tuesday, March 19, when Customs and Border Patrol detained three members of an immigrant family, including a 12-year-old daughter. After this detention, the father was deported. While this family was being separated, Customs and Border Patrol was on the University of Arizona campus recruiting students." The detention of three immigrant family members after a minor traffic stop on Tucson's south side was captured on video and furthered tensions between immigration activists and law enforcement. Border Patrol, Department of Public Safety and Pima County Sheriff officers were present at the scene. A GoFundMe account set up to help the family raise money for bail stated that Glenda de la Vega Fernandez, the mother, Jesus Antonio Torres, the father, and Dariana Torres de la Vega, the 12-year-old, have lived in Tucson for over 11 years with their other two children aged 6 and 10. Glenda and Dariana were released without having to pay for bond, while Jesus was deported to Nogales, Mexico on Thursday, March 21. The GoFundMe page said the family is in need of financial support now that Jesus is no longer in the country. The very public detention of this family sparked more conversations about designating Tucson as a "sanctuary" city for immigrants, which is moving forward with the Tucson Families Free and Together ballot initiative that community organizers have been gathering signatures for since late last year. However, the initiative only has the power to limit the activities of Tucson Police Department officers, not county, state or federal law enforcement agencies. Tucson Police Chief Chris Magnus published his opinion about the controversy in the Arizona Daily Star on Sunday, March 31. "DPS made the traffic stop and requested Border Patrol response. BP made the decision to take a family of three into custody. TPD had no involvement in the stop or detention. Nothing in the 'Sanctuary City' initiative would have changed this sequence of events," Magnus wrote. At the club meeting, Del Cueto commented on the DACA students' letter. "I cannot arrest DACA people. Border Patrol cannot arrest you if you're DACA, that's an actual position that you're at within immigration, that's a safe spot," he said. "So why would you be scared if you were a DACA student?" When asked by a student why he thinks people are afraid of Border Patrol and other law enforcement officers and feel unsafe in their presence, Del Cueto said it was because of a long-time cultural belief in the Hispanic community. "Do you remember when [children] misbehaved, your aunt or your grandma, sometimes your mom would say, 'Aye! La policia!'" he said. "Do you guys remember that? I think that's just the way a lot of Hispanic families push it." Outside, the protestors displayed the names of people either killed by Border Patrol officers at the U.S.-Mexico border or who died in their custody on the backs of their shirts. Del Cueto told the students that he was approached by Donald Trump during his presidential campaign and was consulted about border security. Despite repeated claims that he is not politically motivated, Del Cueto has received national attention for his commentary as a prominent member of the BP Union. He has shown public support for the president and the 35-day federal government shutdown over funding for a border wall, but claims he has stayed within BP guidelines of not endorsing political movements or candidates. "We put out something on our local webpage that said 'It is the policy of the National Border Patrol Council not to endorse any candidates, however, if that policy wasn't there, we would not have a problem with endorsing President Trump,'" Del Cueto said. He also commented on the silent protestors outside, saying that they were protesting "correctly" by not disrupting their meeting. Before the meeting ended, he thanked the students for showing up to the meeting despite the protestors' presence. "You guys are the real heroes," he said.